has some kind of a power. He calls it his science. But it’s just an excuse to kill us. When I watched the movie “Trench 11” at the end of last year, I already said this might be the cheaper version of “Overlord“. The starting point was identical. In “Trench 11” it’s a group of soldiers who had to search an abandoned bunker of the Germans. There were rumors the Germans conducted experiments there. The Germans tried to fabricate a chemical product so they could create invincible storm troops and thus conquer the rest of the non-German-Friendly world. The biggest difference between “Overlord” and “Trench 11” is the choice of world war. In “Trench 11” they were wallowing in the trenches during World War I. “Overlord” takes place during the 2nd World War. That means a lot of raised hands and loud clacking of heels. But the rest is actually similar. A film that shows the madness of a filthy war and mixes this with non-human creatures with the madness flowing through their veins. It’s D-Day all over again. Operation Overlord was the code name for the invasion by the Allies in German-occupied Western Europe. Obviously, that’s where the film got its title from. And that’s also where this film begins. A swarm of flying fortresses on their way to France to drop a load of paratroopers. It seemed as if I was watching “The Longest Day” back again. Even the ritual with the agreed code words “Flash” and “Thunder” is used in this movie (I missed the clicking though). The opening scene is still impressive and reminds you of legendary WWII films such as “Saving Privat Ryan” (although the first 15 minutes of the latter were obviously more impressive). The first part is therefore entirely devoted to the mission of a few American paratroopers. The task they need to complete is disabling a radio tower somewhere in a French village. An extremely important assignment, it seems, It sounds far-fetched but the success of the entire invasion depends on it apparently. From the group of soldiers Boyce (Jovan Adepo), Ford (Wyatt Russell, son of) and Tibbet (John Magaro) take center stage. Boyce is the wimp. An inexperienced soldier who’s regarded by the others as useless. Ford is the leading officer who has to make sure the operation succeeds. A gut-eater avant la lettre. And Tibbet is the bigmouth of them all who brags about his sniper qualities. Something that he wants to put into practice in Berlin. He’ll put a bullet through Hitler’s head and thus end this world war rapidly. And then the horror kicks in. Their path crosses that of Chloe (Mathilde Olivier), a French resistance fighter who wants to take revenge on the German occupiers of her village. Understandable, since those Germans systematically use the inhabitants of the village as test animals. Including Chloe’s parents. From here, the film gradually transforms into a horror/zombie film. Not that it’s all so scary or nerve-racking. 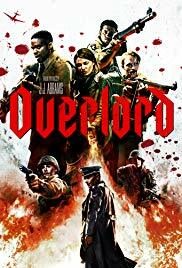 In my opinion “Overlord” is nothing more than a typical war film in which a commando, with a specific mission, not only battles German troops but also non-human opponents. So be prepared for lots of veined bloodthirsty creatures, blown away or crushed body parts and gallons of blood. I wasn’t really impressed by this film. For me, it’s just a more expensive, slick version of “Trench 11“. Maybe I was misled by the trailer. The trailer suggested it would be a blood-curdling zombie movie. Ultimately, the film shows the horror of this world war in a proper way. And there are also a bunch of crazy Nazi doctors who try to create an Übermensch. Something similar as when General Ludendorff sniffs some kind of chemical stuff in “Wonder Woman“, after which he suddenly has superhuman powers. In short, “Overlord” is a pulp war/horror movie. It’s great material to create some kind of videogame from. It isn’t very original and certainly disappointing for the seasoned horror fanatic. But this much I can say. It isn’t boring. On the contrary. It’s entertaining enough. And it’s been expertly put together. It’s worth a look for sure.